Vector graphics design has been inaccessible for way too long: professional softwares are often overpriced and too complicated for non-designers. But not anymore. 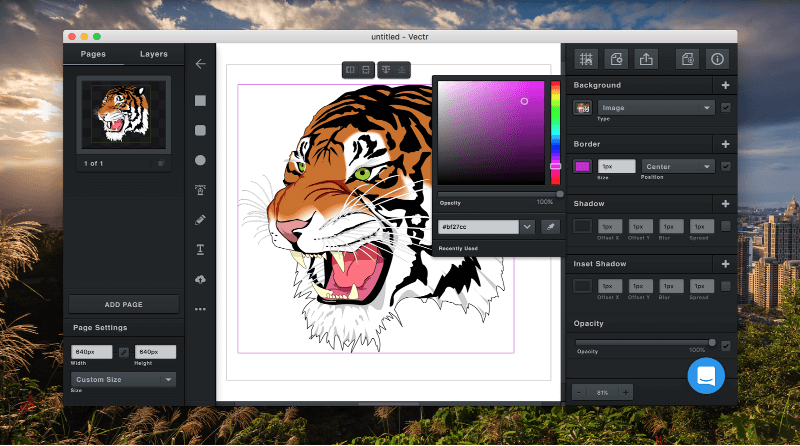 Welcome Vectr – a free graphics editor that you can use on your desktop or inside of your web browser to create professional vector graphics. Vectr is truly cross-platform and has a low learning curve: you can download the software on Mac, Windows, Linux or Chromebook and get started designing something in just a few minutes. The tool lets you create scalable vector graphics using simple and easy-to-use tools; think of it a stripped-down version of Adobe Illustrator. As with other vector imaging apps, you can work with shapes, text and multiple layers. The interface is neatly organized and won’t bog beginners down with non-essential tools and functions. The interface is neatly organized and won’t bog beginners down with non-essential tools and functions. The pages and layers tabs in the left top corner would let you manage your projects, while the filters bar is located on the right side of the interface. You can spice up your graphics with gradients, alter the opacity or add borders and shadows. Simply upload or drag-and-drop the image into Vectr to get started with the software. Vectr lets you import EPS, AI, SVG, PNG or JPEG files – which makes switching from other paid softwares like Adobe Illustrator very easy. Those of you who are just getting started with vector graphics design as a whole can find a great deal of knowledge and practice in the vector graphic design tutorials section. Vectr’s team explains step-by-step how to create most of the common projects. When you’re finished designing, Vectr would let you export your designs in PNG, JPEG and SVG formats. Small hint: SVG is the only truly scalable vector graphics format which can be opened in other softwares, while PNG and JPEG are fit for the web. For bloggers and content marketers, Vectr’s team has also prepared a special vector graphics design guide. It practically covers the most vital topics like typography, color theory and graphic design basics. Its the perfect tool to use if you are creating a website and would like to edit images. Vectr is also truly collaborative. Each design has a unique URL which can be shared with friends or colleagues directly. You can also post your designs to Facebook or Twitter. The team also claims that they’ve built a powerful collaboration engine under the hood which is going to allow for Google-docs style collaboration possibilities for professional designers. While this can do a lot of great stuff with vectors, I want to focus on the WordPress integration as this is pretty unique. You can use and create vectors from right within the WordPress post editor.Just install the free Vectr plugin and you can then click into it in the visual editor. Vectr’s team is not going to stop there however. The product has an ambitious roadmap, according to which the marketplace of designs is coming over this summer and the PRO account with some advanced features is going to be available in 2018.